Some local residents living close to the Dale Farm travellers' encampment believe the eviction may be constantly interrupted by court orders and legal attempts, and that the site clearance may not even take place this year. The pessimism amongst the Cray's Hill residents, some of whom back onto the illegal site, comes after a last minute appeal to the High Court in London resulted in a judge halting the operation to clear the site at the eleventh hour. On Monday 19th September this week it looked as though bailiffs would finally move in. In the days leading up to the proposed eviction, a huge compound had been built with fences erected, cranes moved in and portaloos set up. As the sun rose over the site hundreds of press descended on the entrance to the site, outnumbering travellers, protesters and bailiffs. But it soon became clear that any move against the illegal site would not be swift and that many contingency plans had not been finalised. Basildon council's plans for the media were confused. They had told the press to park at a nearby golf club but the security at the site claimed they were unaware of any arrangements. It resulted in hundreds of vehicles being parked along the narrow roads leading up to the site. Even if the site clearance had begun, it would have been difficult to remove caravans due to the lanes blocked with cars, vans and satellite trucks parked up. The first excitement was when veteran broadcaster Gloria Hunniford arrived at the site. Reporting for ITV's This Morning there was a flurry of excitement as photographers surrounded her as she walked towards the main barricade along with two burly security guards. 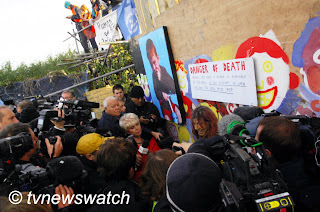 She joined dozens of other reporters at the front line where a representative of the travellers announced that a woman had attached herself to the barricade with a bicycle lock and that there was a danger of death should force be used to remove the obstruction to the illegal part of the site. There then followed a long period of calm. Photographers wandered around with little to do other than to take pictures of the Essex police helicopter which circled above periodically. Some of the travellers engaged the reporters. There was little hostility, though two travellers were walking around and asking if anyone was from the Echo, a local newspaper. "Are you from the Echo?" they asked, explaining that Echo reporters were not welcome because of "all the lies they've printed". "We'll beat the s*** out of them if they come down here," one traveller said. The long wait went on. Bored reporters played Angry Birds on their mobile phones. Some began to cook breakfast on portable stoves. Meanwhile broadcasters were doing live reports, though there was in fact very little to report. At midday a press conference was held within the compound set up by the bailiffs. Councillor Tony Ball, standing alongside local MP John Baron, insisted the site clearance would begin on Monday, but did not give a time scale. Then came the first bit of action of the day as a group of bailiffs wearing blue tabards and yellow hardhats made their way towards the barricade at around 15:00. Stopping just short of the entrance the bailiff used a megaphone to convey a message to the travellers. Surrounded by a throng of reporters and photographers, and heckled by protesters, many will not have heard his ultimatum. "I have some major health and safety concerns that I wish to discuss with you," he thundered through the megaphone. "That you have deliberately blocked and are, by your actions, obstructing the emergent access road." "In addition to that, I am concerned that the structure you have erected has the potential to put people's lives in danger, I am concerned for your well-being and the well-being of BBC's (the Basildon Borough Council not the broadcaster) agents who have been tasked to restore this land. In the interests of health and safety is there anything that I can say or do that will persuade you to remove yourselves in an orderly manner?" And with that, they turned and made their way back to the bailiff compound. This was certainly not the ''surrender or die'' ultimatum that some might have expected. And with such a weak call to disperse, it seemed unlikely that any of those holed up behind the barricade were going to heed his call and disperse. In Shakespeare's Henry V, he called on the French to surrender or "defy us to our worst." In the dramatic scene from scene III the king says, "How yet resolves the governor of the town? This is the latest parle we will admit; Therefore to our best mercy give yourselves; or like to men proud of destruction defy us to our worst: for, as I am a soldier, a name that in my thoughts becomes me best, If I begin the battery once again, I will not leave the half-achieved Harfleur, 'till in her ashes she lie buried. The gates of mercy shall be all shut up, and the flesh'd soldier, rough and hard of heart, in liberty of bloody hand shall range with conscience wide as hell, mowing like grass, your fresh-fair virgins and your flowering infants. What is it then to me, if impious war, array'd in flames like to the prince of fiends, do, with his smirch'd complexion, all fell feats enlink'd to waste and desolation? What is't to me, when you yourselves are cause, if your pure maidens fall into the hand of hot and forcing violation? What rein can hold licentious wickedness when down the hill he holds his fierce career? We may as bootless spend our vain command upon the enraged soldiers in their spoil as send precepts to the leviathan to come ashore. Therefore, you men of Harfleur, take pity of your town and of your people, whiles yet my soldiers are in my command; Whiles yet the cool and temperate wind of grace o'erblows the filthy and contagious clouds of heady murder, spoil and villany. If not, why, in a moment look to see the blind and bloody soldier with foul hand defile the locks of your shrill-shrieking daughters; Your fathers taken by the silver beards, and their most reverend heads dash'd to the walls, your naked infants spitted upon pikes, while the mad mothers with their howls confused do break the clouds, as did the wives of Jewry at Herod's bloody-hunting slaughtermen. What say you? Will you yield, and this avoid, Or, guilty in defence, be thus destroy'd?" While such an ultimatum might have been a little strong to convey to the travellers at Dale Farm, one cannot imagine Henry V calling on the French in Harfleur to leave because of health and safety issues. But this is 2011, and not the 15th century. Today issues of health and safety have to be recognised. And all legal options have to be exhausted. And then came the word that there would be no breach on the gates of Dale Farm after a last minute reprieve cam through from the High Court. The news was greeted with triumphant jubilation on the travellers' side, but it was a humiliating setback for Basildon Council who have fought legal battles over 10 years to get to this point. Councillor Tony Ball said he was "extremely disappointed and frustrated" at the decision, but said that the council would appeal the decision. The earliest date would be Friday, and any likely decision might not be issued until the early afternoon. Justice Edwards-Stuart had granted the injunction at London's High Court on the basis there was a realistic apprehension that the measures to be taken, while genuinely believed in by the council, "may go further" than the terms of the enforcement notices [BBC]. One stipulation made to Basildon Council was that detailed eviction notices relating to each of the 51 illegally occupied plots should be handed out to the travellers [BBC]. That has now been complied with and Basildon Council say that if it succeeds in overturning the injunction on Friday, action could recommence within hours. "I am absolutely sure when they hear our side the judge will rule in our favour," Tony Ball said on Monday. For Basildon Council, and now Luton Council, it is no so much "once more unto the breach", but once more to the court.